Iconic sports car designs don’t come along too often, usually only once or twice per decade. In the 1940s, we had the Jaguar XK120, in the ’50s the Mercedes-Benz 300SL, in the ’60s the Jaguar E-type and the . 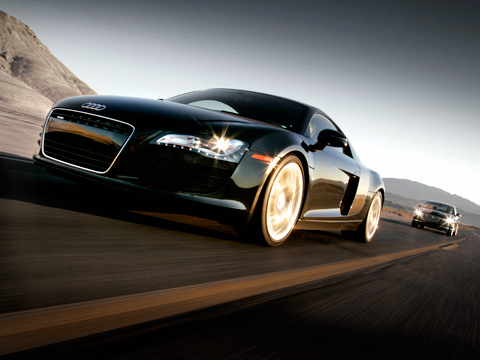 For us, the car that will live on in memory as the icon of the first decade of this century is our 2008 Automobile and Design of the Year, Audi‘s R8. It is one of those rare designs that jumps to the eye whenever you see it, no matter how many times that may happen. Even as LEDs are now being added to all Audis (among other makes), the R8’s headlamp treatment remains distinctive and dramatic. Drama is a big part of the appeal of Walter de’Silva’s brilliant “blade” panels behind the R8’s cockpit. We loved seeing them flash through distant foliage on our All-Stars drive last year, and their power of attraction has not dimmed in the least. That detail has had to be diminished for the forthcoming droptop version, but it remains a stylistic high point for the coupe, which will always be the core design statement. The R8’s proportions are dramatic, too; it is wide, low, astonishingly purposeful for what is, after all, a luxury grand tourer as much as it is a pure sports car. The near-perfect synthesis of the key characteristics of Audi’s flagship A8L sedan and its all-conquering R8 and R10 Le Mans racers sets the R8 apart from all the other excellent all-wheel-drive supercoupes. From the bargain-priced to the over-the-top Lamborghini Murciélago, by way of the classic Porsche 911s, none of them is quite as comfortable or quite as satisfactory for everyday, all-weather use as the easy-to-drive, very high performance R8, clearly an outstanding All-Star. “This is the best Jaguar I have ever driven,” said one logbook note; “…a very good car that beats the Germans without feeling German,” said another. The editor who penned that continued: “Just a beautiful, composed, powerful, lush car,” which nicely sums up what Automobile Magazine thinks of the Jaguar XF. This is an exceptionally good product, despite financial constraints forcing use of steel bodywork on the outgoing S-type’s platform. That means it is heavier than the bigger aluminum XJ sedan but still impressively quick and wonderfully refined. One staff member who drove three different XFs in a two-week period found a single flaw in all three: opening the glove box was difficult to impossible. After successive generations of trouble-prone Jags with an infinite variety of problems, this counts almost as a miracle. The XF is not the best-looking Jaguar ever, but it elicited favorable comments from onlookers everywhere we went, and at least from the front, it is unmistakably a Jaguar thoroughbred. “Grace, space, pace” was Jaguar’s mantra for decades. There is controversy concerning the first element, but the car definitely is roomier than its predecessors, and as far as pace is concerned, the 420-hp supercharged XF is absolutely astonishing. Driving it is not just about going fast, though; it is smooth, refined, and comfortable for driver and passengers alike when being pressed to deliver its full potential. There is ample luggage space, the seats are exceptionally cosseting, and it is altogether a true luxury sport sedan. The electrically tumescent transmission selector dial may be annoying to some users, but in the case of the XF, progress is real. The improvement over everything that has gone before is tangible, not illusory. Thus, we have a worthy All-Star. More than three decades after the original gave Americans a whole new notion of automotive space utilization, the Honda Fit has come along to amaze a new generation. Even more so than its forebear, Honda’s latest small wonder encloses a vast interior in a diminutive footprint. The unusual placement of the Fit’s fuel tank under the floor beneath the front seats allows greater cargo-carrying versatility than any other small hatchback, as the rear seats don’t just fold and tumble in the usual fashion, but the cushion also can be tipped up to expose the wide, flat floor underneath. The Fit is an equally commodious carrier of human cargo, offering both front and rear passengers supportive seats, a comfortably high seating position, and easy ingress and egress. A low cowl and a generous glass area allow occupants to enjoy the view out. As you’d expect, fuel economy is stellar (EPA ratings as high as 35 mpg highway and 28 mpg city) and yet performance is respectable, too; Honda’s 1.5-liter four spins smoothly to its redline and sounds good doing so. All of these qualities were apparent when the Fit first landed on our shores less than three years ago, but that earlier version, already well into its life cycle when we got it, was not as refined as the new-for-2009 model. The renewed model’s extra polish vaults the Fit into All-Star territory. It elevates the small-car experience with its smoother gearbox, nicer cabin, sleeker exterior, and expanded equipment list – although we’d still welcome more feel from the electric power steering and a more widespread availability of stability control. As it is, the Fit is a winner not just in the pages of Automobile Magazine, but in today’s tough retail sales arena, where it has been a runaway success. It has also reestablished, for a whole new generation, Honda’s mastery of the small car that lives large. Conventional wisdom says that the way forward for embattled U.S. automakers is to concentrate on building small, fuel-efficient vehicles. It might seem, then, that Ford‘s introduction of the Flex, with its seven-passenger capacity and generous proportions, is particularly ill-timed. But the Flex is a vehicle that defies conventional wisdom. From the first, we were taken by the Flex’s exterior design, which is both thoroughly modern and – with grooved body sides and an upright stance reminiscent of wood-sided station wagons from the 1940s and ’50s – harks to the glory days of U.S. automakers. Although the distinctive Flex doesn’t fade into the automotive landscape, its design has a subtlety that is untarnished by overwrought badging or tacky add-ons. The interior is equally appealing. Chock full of high-tech features and yet supremely user-friendly, the cabin of the Flex is a masterpiece of ergonomic engineering. Material quality is first-rate, and every piece of switchgear has been designed for usability and ease of motion. The wide-opening rear doors and low step-in height provide easy access to the rear. Legroom in the second row is extremely generous, and the third row will easily accommodate adult-sized passengers. When equipped with options such as a refrigerated compartment between the second-row seats and a DVD player, passengers can ride in style for hours on end. On the road, the Flex wafts along in hushed comfort, reflecting the emphasis that has been put on reducing noise, vibration, and harshness. The lone powertrain is a 262-hp, 3.5-liter V-6 mated to a six-speed automatic. Although it does the job well (and returns up to 24 mpg on the highway), we look forward to the introduction of Ford’s turbocharged, direct-injection EcoBoost V-6, which debuts later this year. The Flex defies conventional wisdom by being big when small is the watchword of the day, by eschewing the aggressive stance of SUVs to concentrate on refinement, and by emphasizing style while being as practical as a minivan. For that, the Flex is a 2009 All-Star. 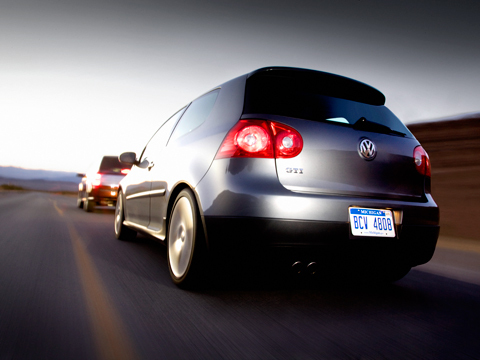 Hurry, the GTI is going fast. Although it might seem unlikely that anything is selling quickly in this market, the fact is, the current Volkswagen GTI isn’t going to be around much longer. The hatchback’s German assembly line recently retooled for the car’s upcoming replacement, and this leaves only the 2009 GTI models that are left on dealer lots for enthusiasts to fight over until the new, sixth-generation GTI arrives here in September. So, the current GTI earns yet another Automobile Magazine All-Star just as the curtain closes on its act. That’s quite an accomplishment. And what an act it’s been. We first drove this return-to-its-roots GTI in Europe in late 2004, when an elated senior editor Joe Lorio concluded, “The numbers are great, but what puts a smile on your face is the eagerness with which the GTI responds.” Faster competitors, such as the Mazdaspeed 3, came but did not conquer. The manic, 8000-rpm Honda Civic Si was in the fight. But the VW’s performance, comfort, and functionality kept it out front in the race to be the best sporty compact car and also made it our 2007 Automobile of the Year. It’s easy to understand our continued enthusiasm. A mere $23,640 buys a magnificent direct-injection turbocharged engine, a six-speed manual, a ten-speaker stereo with satellite radio, and heated seats draped in totally cool, hark-back-to-the-original-GTI tartan plaid fabric. If you need more utility, pony up $600 for the four-door version. You can also add a dual-clutch automatic transmission that keeps both manual-gearbox detractors and fans happy. Those not afraid to cross the $30,000 barrier can add options like leather seats, a sunroof, and a touch-screen navigation system. Larding the GTI with too many options, though, just ends up taking away from the car’s focus and purity, a problem suffered by nearly every variation of the VW since the 1992 GTI 16V model departed. Never mind that we’ve had only three years to enjoy the current GTI: this car carries the three-letter badge with pride. Let’s just hope the next act in the GTI saga is as impressive. When first exposed to the brutal force – both accelerative and acoustic – of the Chevy Corvette ZR1, our office manager, Jackie Guenther, a doting mother of two, spewed forth a 100-decibel string of blasphemous expletives that would have done to the Flying Nun what water did to the Wicked Witch of the West. And copy editor Rusty Blackwell, an introverted, churchgoing man, said he had a hard time discussing the ZR1 without using profanity. Indeed, his handwritten notes would have George Carlin giggling in his grave. The thrilling reality is that few words this side of the F-bomb have the ability to adequately convey the rush provided by the most powerful Corvette ever. The simple, abbreviated text message you’ll send to your friends after driving one is probably the best way to explain what the ZR1 feels like: OMG LOL! And LOL you will. This world has produced cars faster than the ZR1, but precious few of them offer the same combination of sound, speed, and silliness. The ZR1’s $106,520 base price is steep by Corvette standards, but it must pale in comparison with the bribe Chevy surely paid to get this screaming brute to meet the government’s pass-by noise regulations. Hold your ears and mash the throttle; the supercharged V-8 makes so much torque that it threatens to spin the enormous rear tires at any point from idle to redline in the first couple of gears. 60 mph comes in first gear (in 3.7 seconds) and, OMG, is that 91 mph in second? Like all Corvettes, the ZR1 is immediately dismissed by Euro-snobs and fans of tuned Japanese cars as being cheaply built and too unrefined. The plastic window in the hood is cheesy, the seats are unsupportive, and the ZR1 looks too much like a base Corvette, they say. But when the ZR1 can turn quiet moms into screaming sailors, morph religious men into foul-mouthed heretics, and reduce us jaded journalists to giddy text-messagers who can type nothing more eloquent than “OMG” and “LOL,” you know you’ve just found yourself a very deserving All-Star. In a world racked by change, it’s gratifying to know that one sports car remains true to its school. From its birth in 1964 to the arrival of an improved edition last year, the Porsche 911 has been a rare island of tranquility amid seas of turmoil. Except for revised lamps and new bumpers, the ‘s exterior is unchanged. All the action is inside: Power ventilated seats. New infotainment gear. Larger brakes in the base model. Two completely redesigned engines and a PDK automatic transmission good enough to convert clutch-pedal-and-stick devotees to power shifting. The fortified sixth-generation 911 is gutsier and quicker accelerating, yet it squeezes an additional mpg or three from every gallon of premium. Porsche wasn’t the first to implement direct fuel injection and a dual-clutch transmission, but this brand consistently rewards the patience of its fans. 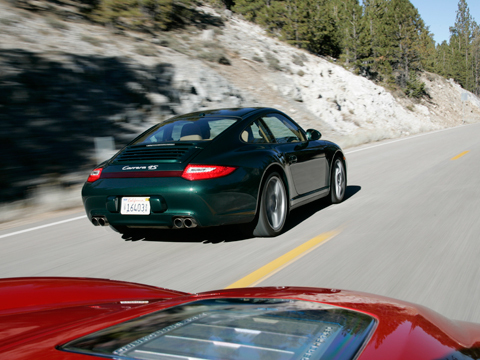 Breadth of character is another of the 911’s endearing traits. 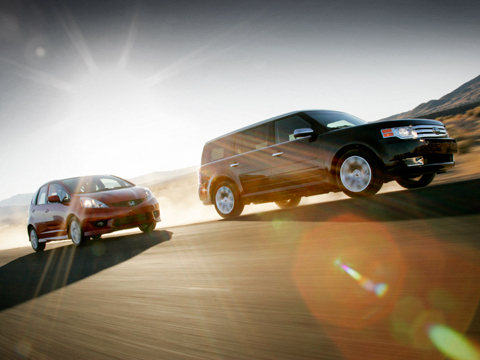 Would you prefer rear- or all-wheel drive? Coupe, convertible, or glass-topped Targa? Normal aspiration or twin turbochargers? Lavishly outfitted for grand touring or bare knuckles for track days? Unless you need a pickup box or a DVD entertainment system for the munchkins, there’s a 911 for every purpose. What’s not to like? We’d prefer shifting the new PDK automatic with paddles instead of Tiptronic-style spoke buttons. Prior generations of the C-class AMG model always had an identity crisis, for one simple reason: the AMG performance philosophy doesn’t scale down. Mercedes-Benz’s mind-set for its AMG cars is to offer insane power in a package that skews toward luxury. Whether it’s the S-, SL-, CLS-, or E-class, the AMG treatment features big power coupled with cushy suspension, an automatic transmission, and subtle exterior cues. But that posh-performance recipe doesn’t translate to the harder-edged, -defined world of the small sport sedan, so previous hot-rod C-classes always felt a little bit too mature for their size, like a ten-year-old doing tax returns. This latest one, though, flips the formula. The C63 AMG makes the leap to the All-Stars list because it sacrifices some restraint, some of that Mercedes family DNA, in its quest to be a better driver’s car. The ride is stiff. The seats don’t offer you a massage. The scoops and spoilers that adorn the bodywork are more extroverted than anything this side of a Black Series. But the engine is pure AMG, a handbuilt paean to big-bore V-8 torque. If the -V is something like a four-door Corvette ZR1, the C63 is more like a sedan version of the Z06 – ultimately not as fast, but lighter and defined by the raw, rev-happy purity of normal aspiration. It’s a fine formula. With that 6.2-liter V-8 somehow crammed between the front fenders, the C63’s defining dynamic trait is its brutal, ferocious, knock-the-wind-out-of-you midrange power. If you’re on the gas and hit an expansion joint at, say, 60 mph, the traction control light goes bonkers. That’s how hard it’s pulling. And with the seven-speed transmission constantly dropping the engine straight into its sweet spot, you might not want to bother with the steering wheel paddles except for downshifts, when manual gearchanges are rewarded with a diabolical, crackling throttle blip. There are other cars in the AMG portfolio that are faster, but this one is the most fun. 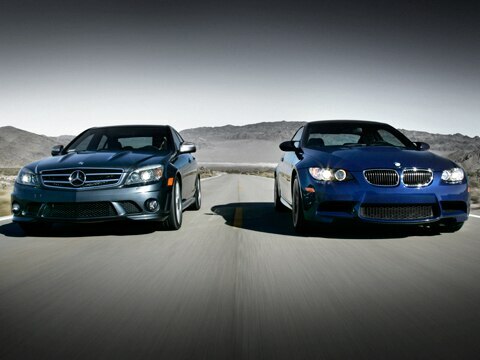 Don’t stop the presses: the BMW 3-series and M3 get another All-Star award. Ho-hum. Haven’t we heard this song and dance before? Like about a million times? (Fourteen, actually.) As always, the competition for the 3-series keeps getting fiercer, and, as usual, critics say the latest, greatest M3 is a bit too refined. But BMW’s masterpiece of all-things-to-all-people engineering remains more fun than anything that’s more practical and more practical than anything that’s more fun. Now that the shock waves caused by Chris Bangle’s original design have dissipated, it’s tempting to dismiss the 3-series as a humdrum totem of upper-middle-class pretentiousness. But don’t be misled by its conventional shape or its considerable girth. Although the car is large enough to carry grown-ups and their belongings in style and comfort, it magically seems to shrink to sports car dimensions when it’s pushed. And pushing it is so easy thanks to the magnificent engines BMW has provided for just this purpose. The high-line 335i ships with an obscenely torquey twin-turbo powerplant that represents the apotheosis of in-line-six architecture. But BMW engineers realized that they needed to go a step further with the M3. And since they couldn’t improve on perfection, they created a brand-new engine for their M-mobile. The result is a 4.0-liter, 8400-rpm V-8 that makes 414 hp and the most exotic noises this side of a racetrack. Those looking for a Nürburgring record can opt for shift paddles and the dual-clutch gearbox. But even in M3 guise, the 3-series doesn’t pretend to be a race car. BMW is all about melding car and driver into a seamless whole, whether the occasion is cruising in the carpool lane or tearing it up during a track-day time trial. The driving experience is always rewarding, never demanding. Because no matter how good you are, the 3-series is always a little better. Which makes it an All-Star in our book. Not long before this issue of Automobile Magazine went to press, the CEOs of General Motors, Ford, and Chrysler testified at congressional bailout hearings, where they were excoriated for their respective firms’ alleged unwillingness and inability to build safe, attractive, fuel-efficient cars that can compete with Japanese products. Clearly, Senator Richard Shelby (R-Alabama) and his esteemed but ill-informed colleagues on the Hill were not aware of the latest Chevy Malibu, a family sedan that is more enjoyable to drive than the , better looking than the , and available with two different powertrains that deliver more than 30 mpg on the highway – a 2.4-liter four-cylinder mated to a six-speed automatic, and a gasoline/electric hybrid. Did we mention that the most important safety advance of the past twenty years, stability control, is newly standard on the Malibu but still optional on the Camry? 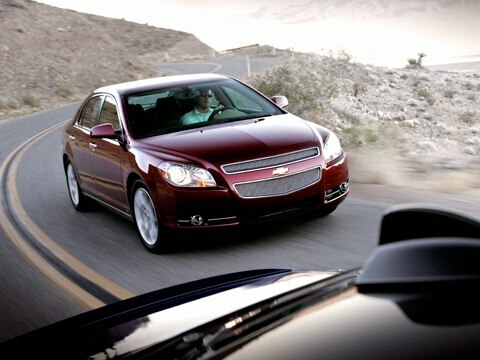 But there’s no need to assemble a laundry list of the Malibu’s strengths versus its many competitors. Just drive one, and you’ll see why we’ve named it an Automobile Magazine All-Star for two years in a row, and why it’s a family car that neither its maker nor its owners need apologize for. How did that happen? Because when GM set out to build a new generation of mass-market American sedans on its global Epsilon platform (the company prefers to call it an “architecture”), the development process started with the Pontiac G6, which is OK, advanced to the Saturn Aura, which is very good, and culminated with the Malibu, which debuted to acclaim for the 2008 model year. The additional time, quite frankly, gave GM additional opportunities to fuss over the details. The result is a sedan with crisp handling, communicative steering, a properly tuned ride, and an overall feeling of quality – especially in the handsome interior – that so often has escaped American sedans in the past. American car buyers have noticed. Perhaps America’s leaders will do so, too. Concerns about R Tronic aside, it was certainly a delight to get into an R8 again. Is Audi Prepping An Electric R8 Concept for the 2009 Frankfurt Motor Show?